Safe on Flame with its innovative engineering design and proven dependability has proved as an amazing gas-saving device. Safe on Flame is approved by the government of India. It is used on LPG & CNG cylinders to regulate the flow of gases. While if there occurs a major leakage, Safe on Flame provides you the auto shut-off facility and even facility to check minor leakage. The best thing is that Safe on Flame, saves 30% of LPG & CNG gas and it is easily & quickly fitted to most gas cylinders. The most important factor that you will get Safe on Flame with three years warranty from the date of purchase. Safe on Flame is an exceptionally reliable, high-quality gas safety device regulator using the finest components that conform to international standards. 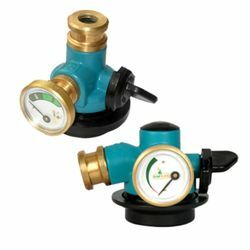 This gas safety device regulator has priced affordably and gives you total peace of mind. Besides, it helps you reduce gas consumption and the system pays back for itself in a short time. What you are buying is not just a gadget or accessory, it is insurance and peace of mind for yourself and for your family. A must have this gas safety device regulator installed to avoid an accident as Safe on Flame is not only a product but a service provider to mankind. You cherish your family and always think about their well being. Safe on Flame converts your thoughts into practice by introducing an instrument that prevents “Gas Leak” and thereby the fearsome accidents caused due to the Gas Leak. Used with LPG/CNG cylinders to regulate the flow of gases. Auto shut off facility while major leakage. Safe on Flame works in 3 ways for you. Shows gas level in the cylinder. Detects gas leakage which auto shuts off gas flow immediately to prevent accidents. Detects leakage in your gas stove which can be repaired before any mishaps. They believe in the statement “Prevention is better than cure”. On this principal Ensuring and Insuring the well being of your family members and loved ones is must. In few words, Safe on Flame is “Your Safety Factor” Trust. DescriptionSafe on Flame with its innovative engineering design and proven dependability has proved as an amazing gas-saving device. Safe on Flame is approved by the government of India. It is used on LPG & CNG cylinders to regulate the flow of gases. While if there occurs a major leakage, Safe on Flame provides you the auto shut-off facility and even facility to check minor leakage. The best thing is that Safe on Flame, saves 30% of LPG & CNG gas and it is easily & quickly fitted to most gas cylinders.The most important factor that you will get Safe on Flame with three years warranty from the date of purchase. Safe on Flame is an exceptionally reliable, high-quality gas safety device regulator using the finest components that conform to international standards. This gas safety device regulator has priced affordably and gives you total peace of mind. Besides, it helps you reduce gas consumption and the system pays back for itself in a short time.What you are buying is not just a gadget or accessory, it is insurance and peace of mind for yourself and for your family. A must have this gas safety device regulator installed to avoid an accident as Safe on Flame is not only a product but a service provider to mankind. You cherish your family and always think about their well being. Safe on Flame converts your thoughts into practice by introducing an instrument that prevents “Gas Leak” and thereby the fearsome accidents caused due to the Gas Leak.Benefits of Safe on Flame:Used with LPG/CNG cylinders to regulate the flow of gases.Auto shut off facility while major leakage.Facility to check minor leakageSaves 30% of LPG/CNG gasHigh and Low-level gas indicatorPrevent Accidents in Your KitchenBest device to save LPG/CNG gasSafe on Flame works in 3 ways for you.Shows gas level in the cylinder.Detects gas leakage which auto shuts off gas flow immediately to prevent accidents.Detects leakage in your gas stove which can be repaired before any mishaps.They believe in the statement “Prevention is better than cure”. On this principal Ensuring and Insuring the well being of your family members and loved ones is must. In few words, Safe on Flame is “Your Safety Factor” Trust.